These stuffed peppers are made with all of the flavors you'd find in a Philly Cheesesteak sandwich. Shaved steak, caramelized onions, and bell peppers make up the filling for these amazing stuffed bell peppers, along with optional sliced mushrooms and a topping of shredded cheese. The recipe has a few cooking steps, but preparation is easy, and the list of ingredients is simple. If you like steak and cheese sandwiches, you'll love this combination, and it's gluten-free! Use fresh, good-quality, shaved steak if possible -- sirloin, flank, bottom round, etc. Frozen shaved steak cooks quickly and will do in a pinch. Pepper jack cheese made up our topping, but cheddar jack, Muenster, American, or your favorite melting cheese would work just fine. Or top them with Cheez Whiz to make them even more like the original Philly Cheesesteak. Cut four of the peppers in half lengthwise. Remove the seeds and ribs. Set aside. Remove the seeds and ribs from the fifth pepper, and chop it coarsely. Set aside. In a large skillet or saute pan, melt the butter with 1 tablespoon of vegetable oil. Add the sliced onions and cook over medium heat, stirring frequently, until browned - about 15 minutes. Add the chopped peppers and mushrooms, if using. Continue cooking until mushrooms are golden and the peppers are tender. Remove to a plate, and set aside. If necessary, add another tablespoon of oil to the pan, and cook the shaved steak, stirring, until evenly browned. Add the onion and pepper mixture back to the pan. Season the mixture with salt and pepper and the Worcestershire sauce. Heat the oven to 400 F. Line a 9 x 13 x 2-inch baking pan with foil, or spray with nonstick cooking spray. Fill a large saucepan, Dutch oven, or deep saute pan with enough salted water to cover the peppers (don't add them yet). Bring the water to a boil, and then add the pepper halves. Cover and simmer for about 4 minutes, or until just tender but not too soft. Carefully drain the peppers and arrange them -- cut side up -- in the prepared baking dish. Fill each pepper with the steak and onion mixture. 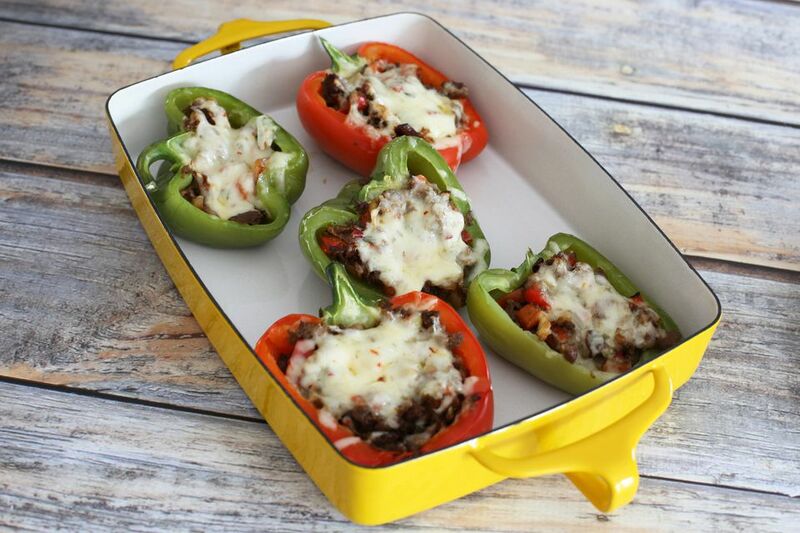 Top each filled bell pepper with a generous amount of shredded cheese. Bake for about 10 to 12 minutes or until the cheese is melted and the filling is hot. For a cheesier topping, add more cheese just before the peppers are done baking.